In January 2014 Stanbic bank Zambia gave more than 80 per cent of Mopani Copper mine workers loans. The loans, which ranged from K50, 000 to K80, 000 each for general workers had a five-year contract term, that is, contracts for miners who obtained loans in 2014, were supposed to end in 2019, provided that the bank deducted its monthly dues as agreed. But we are talking about a killer and scammer bank here. Just after signing up the miners, Stanbic changed the contract period from 5 to 10 years. ‘Two years down the line Stanbic came back with terms and conditions that they are extending the period of borrowing from 5 years to 8 years. Most of us flocked to the bank to understand more. We were told to choose one thing: You either sign to increase the amount they were deducting or increase the period from 5years to 8 years. Very few people managed to do that.’ So, miners remained on the extended period but paying the same monthly amounts. In 2017, the South African Bank again informed the miners that it has increased the loan contract period by two more years. The loans which were supposed to end in 2019 will now ‘hopefully’ end in 2024. So, the miners have remained enslaved to Stanbic. What this means is that, miners will be paying more in terms of interest to Stanbic Bank than what was agreed in the initial contract. Stanbic Bank is evil and destroys Zambian people. Let’s do the calculations here for the miner highlighted above. He obtained K55, 000 in 2014 and it was agreed that he will be repaying K1, 300 each month for 60 months (5 years). By the end of the contract in 2019, he should have paid K78, 000 in total. This was the initial and normal contract. 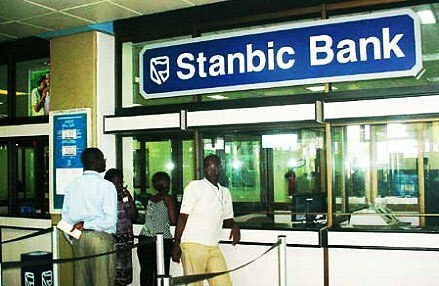 Stanbic bank would have received it’s K55, 000 principal amount plus K23, 000 interest. But no. Stanbic increased the duration of the contract to 10 years but leaving everything else intact, meaning, the miner will continue paying K1, 300 per month for 10 years. At the end of the 10 years in 2024, the miner would have paid K156, 000. Remember he only got K55, 000 in 2014 but he will give back Stanbic K156, 000. Do we have a government in place? The other miner mentioned earlier who was granted a K65, 000 loan in 2014 with a monthly deduction of K1600 by Stanbic was supposed to have paid K96, 000 in total to Stanbic, but now he will have paid K192, 000 at the end of the 10 years. Recently, Mopani announced that employees willing to go on Voluntary Separation could freely do that. Most miners decided to check their Stanbic loan balances so that they could pay them off. But because Stanbic had unilaterally extended the loans duration which initially was 5 years period to 10 years, they could not afford to pay off so chose to remain in employment so that they continue paying Stanbic interest until 2024. Typical of an evil bank which is in Zambia to exploit local people, when a miner who owes Stanbic is retrenched, Stanbic takes all the money from the retrenchment package leaving the miner with nothing. In 2015 when copper prices went down, Mopani downsized its workforce and paid the retrenched miners’ redundance packages. This money went into the Stanbic accounts because it was part of the loan contract that miners should only have bank accounts with Stanbic and the employer Mopani undertook to channel all payments for miners into Stanbic accounts. Stanbic grabbed this money leaving retrenched miners with nothing. It was widely reported in the media that time how one retrenched miner hanged himself after Stanbic confiscated his money. The government had to intervene and order Mopani to pay retrenched miners through the Post office, but it was too late for most miners. ‘Most of us who got loans in 2014 will stop paying in 2024… That is how bad things her. I wish we had someone to help us on this matter. I personally cannot recommend this bank to anyone,’ complained a miner. But why does Stanbic employ such predatory banking practices on Zambians? The answer is simple. They know they are in Zambia where you can bribe government officials to do as you wish as long as you have money. In South Africa where all the profit from Zambia go, Stanbic, which is known as Standard bank there, cannot even try to steal in day light like they are doing in Zambia. In Zambia they know no one cares. If you try to sue them, they will bribe the judges and you will be made to pay more interests.